When the Great Astronomer Galileo Galilei first observed Venus displaying a Crescent Phase, he excitedly wrote to Kepler (in anagram) of Venus mimicking the moon-goddess. Said that, we believe that he would have been truly delirious with joy to see Saturn and Titan, as seen in this image, doing the same thing. As a matter of fact, more than just pretty pictures, the High-Phase Observations - such as the ones taken while the Spacecraft is looking generally toward the Sun, as it is in this image - are very powerful (scientifically speaking) since the way the Atmospheres and Rings of Saturn transmit Sunlight is often diagnostic of their true Composition and Physical State. 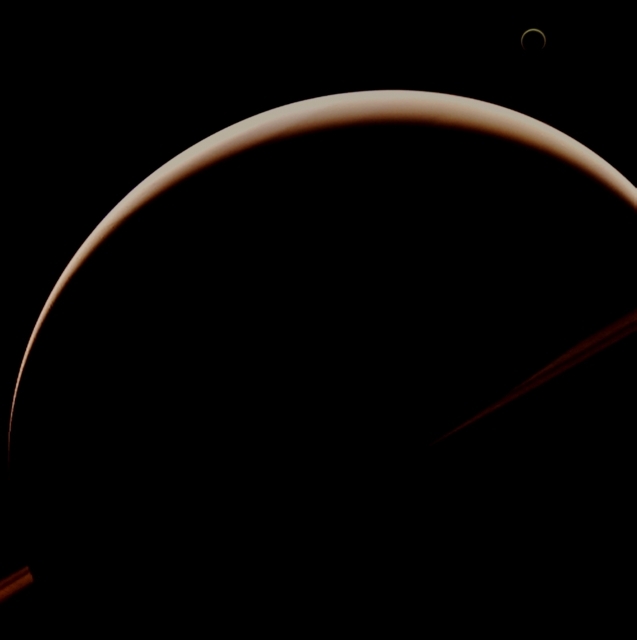 In this example, Titan's Crescent nearly encircles its disk due to the small Haze Particles, located very high in its Atmosphere, that refract the incoming light of a very distant Sun. This view looks toward the Sunlit side of the Rings, from about 3� above the Ring-Plane. The image was taken in Violet Light with the NASA - Cassini Spacecraft's Wide-Angle Camera on August, 11, 2013. The view was obtained at a distance of approximately 1,1 Million Miles (such as about 1.770.274 Million KiloMeters) from Saturn and at a Sun-Saturn-CASSINI Spacecraft, or Phase, Angle of 154�. Image scale is roughly 64 miles (such as approx. 102,997 Km) per pixel. This frame (which is an Original NASA - CASSINI Spacecraft's b/w and NON Map-Projected image published on the NASA - Planetary Photojournal with the ID n. PIA 18291) has been additionally processed, contrast enhanced, magnified to aid the visibility of the details, Gamma corrected and then colorized - according to an educated guess (or, if you wish, an informed speculation) carried out by Dr Paolo C. Fienga - in Absolute Natural Colors (such as the colors that a human eye would actually perceive if someone were onboard the NASA - Cassini Spacecraft and then looked outside, towards Saturn and its moon "Titan"), by using an original technique created - and, in time, dramatically improved - by the Lunar Explorer Italia Team. Different colors, as well as different shades of the same color, mean, among other things, the existence of different Elements (Gases) present in the Atmosphere of both Saturn and Titan, each having a different Albedo (---> Reflectivity) and Chemical Composition. Note: it is possible (but we, as IPF, have no way to be one-hundred-percent sure of such a circumstance), that the actual luminosity of Saturn and Titan - as it is in this frame - would appear, to an average human eye, a little bit lower than it has been shown (or, better yet: interpreted) here.